Deadpool – Touch yourself tonight! Have you ever wondered what was going through your mind on your first day at school? Riley wants to know and, hopefully, all will go well. 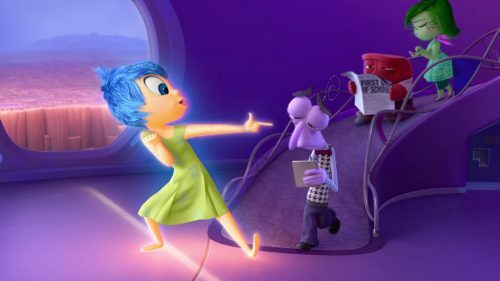 We can find out with the first clip from the upcoming, Disney film, Inside Out. Based in Headquarters, the control centre inside 11-year-old Riley’s mind, five Emotions are hard at work, led by lighthearted optimist Joy, whose mission is to make sure Riley stays happy. Fear heads up safety, Anger ensures all is fair and Disgust prevents Riley from getting poisoned—both physically and socially. Sadness isn’t exactly sure what her role is, and frankly, neither is anyone else. When Riley’s family relocates to a scary new city, the Emotions are on the job, eager to help guide her through the difficult transition. But when Joy and Sadness are inadvertently swept into the far reaches of Riley’s mind — taking some of her core memories with them — Fear, Anger and Disgust are left reluctantly in charge. Joy and Sadness must venture through unfamiliar places — Long Term Memory, Imagination Land, Abstract Thought and Dream Productions — in a desperate effort to get back to Headquarters, and Riley.